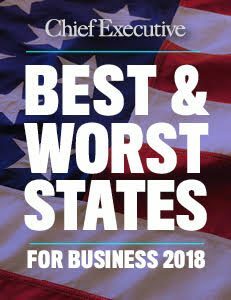 Last month CEO Magazine produced its annual ranking of the best states in which to do business, and, as with previous surveys, our region does very well. But states like Massachusetts risk eroding even those advantages as the cost of living skyrockets in big cities and traffic and other annoyances mount. … The situations of bottom feeders could get worse before they get better, in part because of a particular effect of federal tax reform on high-tax states—like the basement dwellers. “The exit numbers of companies and owners are going to be higher,” McGuire says, “because people won’t be able to deduct as much in property and income taxes. They’re being taxed into oblivion.” Also, the coasts are losing some of their perceived edge in talent and lifestyle amid sharply higher costs of living—and facing steadily increasing digital capabilities in the heartland. This is the most recent item in a long run of stories describing a geographic analog to the process of creative destruction. Those states who spray “startupicide” on the economy – suffocating regulations, inflated business taxes and fees, lawsuit-friendly legal environments, and political classes uninterested in business concerns, if not downright hostile to them – lose economic clout as people and capital migrate to other states with more favorable environments in which to work and live. This migration of economic clout within the US has been more subtle than the California Gold Rush or Irish Potato Famine but is just as significant. Some states are chasing away their earners, workers, and entrepreneurs; this is their tax base. On the first of this month we wrote about the planned “IPO” of shares in Arian Foster, running back for the Houston Texans. Fantex, Inc. is applying the concept of celebrity bonds to professional athletes and securitizing their potential future earnings. At that time we expressed concerns about the business model and the ability to quantify risks or conduct due diligence: (a) it’d be analogous to a musician securitizing songs he planned to compose rather than his library of existing proven songs, (b) a professional athlete’s fortunes can turn on a dime, and (c) their “brand” is easily tarnished by revelations about past or current activities. Last Tuesday brought unfortunate news for Mr. Foster. (Unfortunate but impeccably timed as follow-up to the original story…) He must have season-ending surgery and as a result, Fantex has postponed the IPO. San Francisco-based Fantex last month filed with the U.S. Securities and Exchange Commission to raise $10.6 million in an initial public offering priced at $10 a share for Foster, who pledged 20 percent of his on- and off-field earnings to the company in exchange for most of the proceeds of the IPO. It was to be the first public offering for a professional athlete. When you think about it, many entrepreneurs share a number of similarities with professional athletes (and not just a predilection for hoodies or the phrase “at the end of the day”). A breakout success early in life — say, spending $6.7 million on a stake in eBay that would be valued at $5 billion two years later, or having a 1,600-plus-yard rushing season at age 24 — can be the platform that launches a career. But it can also become, for better or worse, the only thing that defines you. For every hit, there are multiple soul-crushing misses. Hard work and luck have a chicken-and-egg relationship, and the distinction between being the best and just being the best-positioned is often hard to spot. San Francisco start-up Fantex is seeking to issue 1,055,000 shares of Arian Foster tracking stock at $10 apiece – with $10 million of the $10.55 raised going to Foster, who, in turn, will owe Fantex 20 percent of his future income (with a few exceptions). They’re trying to apply the concept of Celebrity Bonds to a professional athlete – in this case, a “trailblazer” (their idea of his brand) like Arian Foster. What it does get you is one share of a “Fantex Series Arian Foster Convertible Tracking Stock” that theoretically will benefit from his future earnings stream. Except that any actual distributions are at the discretion of Fantex, which will also take a 5 percent cut. If you want to buy or sell shares, you need to do so on Fantex’s proprietary exchange, for a brokerage commission. The stock that you own can be abruptly converted, at any time, into basic company stock. (And, again, at the discretion of Fantex.) I’d love to listen in on the customer service calls on the day that a bunch of fans with cash to burn wake up to find out that they’re now proud minority shareholders of an unlisted Silicon Valley venture capital–backed marketing firm. We all love Arian Foster, but just like the running back himself, things can turn on a dime. In his 2007 piece about Protrade, Lewis wrote: “Tiger Woods is a prime candidate to launch the new market. But Tiger Woods’ financial future is secure; he’s the sports equivalent of a blue-chip stock.” (He would soon turn into more of a … speculative investment.) The “Risks” section of the SEC filing on Foster makes mention of his recent admission that he received money while at the University of Tennessee as an example of where Fantex’s diligence failed to turn things up. New evidence from the dismal science confirms what social science has already shown: the love of taxes is the root of unhappiness. The original social science, from the December 2009 issue of Science, indicated that states with the highest taxes also have the least happy residents. Residents of high tax states not only have less money to spend on other things that make them happy, they don’t enjoy many benefits in exchange for all their hard-earned tax dollars. Roads, schools, and crime are no better (and in many cases worse) while their state governments borrow even more and spend disproportionately on public employee pensions and entitlement programs. Their needs ignored at the expense of entrenched special interests, taxpayers get unhappy. And then they get out. From this one might argue causation; high taxes = unhappiness. While we are certainly sympathetic to that point of view, we also have to wonder if it runs vice-versa, or at least cuts both ways: unhappy people like to raise taxes. All the empirical evidence shows that raising a state’s tax burden weakens its tax base. Still, too many blue-state lawmakers believe that a primary purpose of government is to redistribute income from rich to poor, even if those policies make everyone, including the poor, less well off. The obsession with “fairness” puts growth secondary. Meanwhile, in the South, watch for a zero-income-tax domino effect. For the eighth consecutive year, Texas has been voted the best state for business by Chief Executive magazine. The state is growing its own companies but also is displaying remarkable success in luring investments from other states, particularly California, which once again ranks last in our survey. A raft of small, technology companies have either relocated to Texas or moved key operations there. Bigger California companies, such as Facebook, eBay and PetCo also have recently opened operations in Texas, and major manufacturers from different states, such as General Electric’s transportation unit and Caterpillar have located big new plants in Fort Worth and Victoria, respectively. “Employers from around the nation and all over the world continue to look to Texas as the premier location for business expansion, relocation and job growth thanks to our low taxes, reasonable and predictable regulations, fair legal system and skilled workforce,” Gov. Rick Perry told Chief Executive. Texas has powerful momentum and it’s difficult to see what could halt it… The sheer diversification in its economy—all the way from wheat farming to semiconductors—suggests that the state could absorb many punches and keep on rolling. The Tax Foundation has issued its 2012 State Business Tax Climate Index, which once again confirms that the love of taxes is the root of unhappiness. We remain… happy. And happy to report that’s true for our region as well. When confronted with the argument that higher taxes = unhappiness, we wonder, even while remaining sympathetic to the point of view, whether or not it runs vice-versa, or at least cuts both ways: unhappy people like to raise taxes. This is just the most recent study – see also here, here, here, here, here, here, and here – to confirm the country is experiencing the rise of the high-tech South. Two states whose budget woes have garnered recent headlines include Illinois, which pushed through a 45% increase in corporate taxes – apparently triggering an exodus; and California, which is on the verge of running out of money – again. Some states, like the aforementioned California, respond in other “desperate ways” which further undermine investor confidence and entrepreneurial spirits: accounting gimmicks, delayed payments, issuing IOUs, or even more borrowing. As we’ve written before, only one non-Southeastern state – Nebraska – has a lower debt-to-GDP ratio than FL (5th), GA (4th), TN (2nd), NC (3rd), TX and VA (tied for 6th). Our region took 9 out of the 10 top spots in Forbes’ list of The Next Big Boom Towns in the U.S. The rankings were done in conjunction with Mark Schill at the Praxis Strategy Group, and are based on job growth, attractive lifestyle, ease of starting a business, and a broad range of demographic factors. We do love Phoenix, but these are several of the cities we and our entrepreneurs call home. For the seventh straight year, Texas has been voted the best state for business by Chief Exectuive magazine. 2011’s edition of their annual survey of CEOs includes an excellent interactive map. The Top 10 looks familiar to us, as it constitutes most of the geography in which we have focused our investment efforts for over twenty years now, and adds to the growing list of evidence that some states understand job creation better than others. In The Library in St.Pete you will find Amity Shlaes’ The Forgotten Man, in which Shlaes recounts how the TVA crowded out Wendell Wilkie’s Commonwealth & Southern, a private-equity-backed company ($400 million as reported in Wilkie’s testimony before a House committee) that was in the process of bringing electricity to the rural South. Since the TVA could borrow unlimited funds at low interest, and did not have to turn a profit, C&S eventually had to sell its properties in the Tennessee Valley to the TVA in 1939 for $78.6 million. (Fwiw, those events led to Wilkie’s 1940 presidential run.) 71 years after that transaction comes a new study which explores government spending on economic development and its effects on private investment. Harvard professors Lauren Cohen, Joshua Coval, and Christopher Malloy look at increases in local earmarks and other federal spending that flow to states after the senator or representative rose to the chairmanship of a powerful congressional committee. The surprising result: as a result of government spending in their states, companies actually retrenched by cutting payroll, R&D, and other expenses. Some of the dollars directly supplant private-sector activity—they literally undertake projects the private sector was planning to do on its own. The Tennessee Valley Authority of 1933 is perhaps the most famous example of this. Other dollars appear to indirectly crowd out private firms by hiring away employees and the like. For instance, our effects are strongest when unemployment is low and capacity utilization is high. But we suspect that a third and potentially quite strong effect is the uncertainty that is created by government involvement. …Our findings suggest that they should revisit their belief that federal spending can stimulate private economic development. It is important to note that our research ignores all costs associated with paying for the spending such as higher taxes or increased borrowing. From the perspective of the target state, the funds are essentially free, but clearly at the national level someone has to pay for stimulus spending. And in the absence of a positive private-sector response, it seems even more difficult to justify federal spending than otherwise. The implications of these findings for how best to nurture the growth of entrepreneurial companies are interesting. There will no doubt be private growth companies that benefit from government subsidies in areas such as cleantech and alternative energy, given the magnitude of the dollars being spent. But it would seem government could do far more to encourage sustainable entrepreneurial activity more broadly by insuring that the proper tax incentives are in place for new company formation and then also working to keep the regulatory burdens at a minimum. If government does that consistently over a long period of time, the right incentives plus greater certainty will encourage a surge in new entrepreneurial ventures. • Nor have you heard Illinois leaders, in their to and fro over an income tax hike, confront a 2009 report by the American Legislative Exchange Council: A decade’s worth of hard data suggests that states with no individual income tax created 89 percent more jobs, and had 32 percent faster personal income growth, than did states with the highest income tax rates. The report also analyzed 15 policy factors that influence a state’s growth prospects — tax burdens, debt service, tort climate, mandated minimum wage, spending limits if any — and ranked Illinois’ economic outlook as an alarming 44th in the U.S.
• Nor have you heard Illinois leaders confront this state’s devastating rank in job creation, 48th, and ask how they can be friendlier to present and potential employers. Illinois — with its overspending, its borrowing and its worst-in-America pension crisis — faces massive obligations that give potential employers pause. Add to this toxic mix Illinois’ high cost of workers compensation and its 49th-in-the-U.S. bond ratings. How surprised, then, are we that since 1990 Illinois has underperformed the U.S. in job growth?